This article explores social media analysis tools using the wealth of social media data of people’s interactions online for both academic and market researchers. 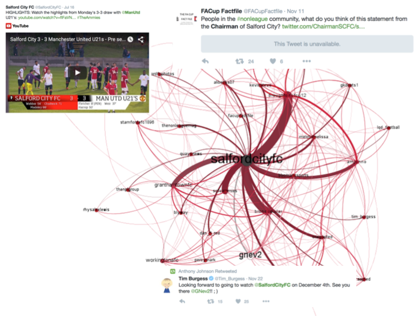 This post comes from my PhD research on Netnography and Salford City FC and forms part of a recent contribution to our new book Digital Marketing: A Results Driven Approach. This post explores the background to SNA (Social Network Analysis) and explores three tools that can be used to generate powerful and meaningful SNA visualisations. Digital marketing researchers may also find these techniques useful to tap into the wealth of social media data to understand online brand communities and social media interactions. The concept of analysing offline social networks with SNA has been part of research for several decades (Groeger and Buttle, 2014). SNA dates back to the 1930’s from graph theory and has been used “to identify network structures that can influence economic outcomes, which are also known as social capital” (Williams et al., 2015). With the growth of online social networks, digital tools for SNA have also grown. These tools date back to around 2000 with the development of “network.S.tools”. These were developed and used by the research community at Carnegie Mellon University and the University of Pittsburgh (Butts, 2008). Groeger and Buttle, (2014) used SNA to better understand the networks involved with word of mouth marketing. They stated that the discipline of marketing “has long ignored a network perspective” and that SNA can address this issue (Groeger and Buttle, 2014, p.1189). What is social network analysis used for? SNA can also be used in conjunction with other techniques as a “means of supporting or adding to data collected by face-to-face methods they may make an important contribution to what is known about a particular field” (Pole and Hillyard, 2016, p.62). SNA can give a deeper understanding of the connections and flows of information and provides a complimentary method to the collection of data through other methods such as netnography, interviews or focus groups. A range of tools can be used to draw out potential issues, create new contacts and add meaning and understanding to the observation and interaction. The method of SNA has a strong connection to social capital (Lin, 1999; Widdop et al., 2014) which is also important to understanding how people interact and behave online and offine. SNA is a means to understanding the influence that actors have on each other and understanding the “structure and “form” of social relations” (Jarman et al., 2014). There are various social media analysis tools that can be used for SNA, which can be intensive computationally (Butts, 2008). These tools can be used to produce data and visualisations of networks in order to “contextualise the position of a single actor and reveal aspects of a more complicated picture” (Jarman et al., 2014). Node XL is a popular tool for conducting SNA to gather data from Twitter into an Excel spread sheet. It has been used for this purpose in many academic courses and studies (Hansen et al., 2011). Gephi may not be as adept at gathering social media data, but the visualisation tools are more powerful and clearer than Node XL. It is also possible to import data from Node XL to Gephi to take advantage of the strengths of each programme and produce clearer visualisations (see above). 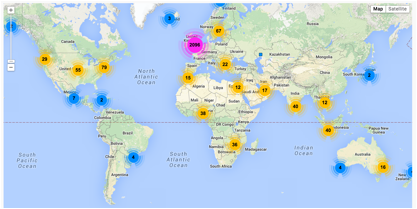 Screenshot showing a global distribution of Salford FC Twitter followers generated using Followerwonk. Another social media analysis tool that can be used to buttress SNA is Followerwonk. This tool has the capability to visualise Twitter networks geographically and compare different user accounts, which is not possible using Node XL or Gephi. Followerwonk is used to understand where in the world or potential fans are based and identify connections and new contacts. It is possible to further look at the content of Tweets from particular regions using Followerwonk. Overall, as social networks grown in number and influence, so to, SNA is becoming an increasingly powerful way to analyse and understand audiences. For a digital marketer, analyst or academic researcher, harnessing SNA and using it in conjunction with other techniques is an increasingly valuable way to understand how people are connected and how influential they are. There are a great deal of possibilities for SNA, how will you use it? Please drop me a line if you would like to discuss this in more depth. Butts, C. T. (2008) ‘Social Network Analysis with sna.’ Journal of Statistical Software, 24(6) pp. 1–51. Edwards, G. (2010) ‘Methods Review paper Mixed-Method Approaches to Social Network Analysis.’ ESRC national Centre for Research Methods, NCRM.015(January) pp. 1–30. Granovetter, M. (1973) ‘The Strength of Weak Ties.’ The Strength of Weak Ties pp. 1360–1380. Groeger, L. and Buttle, F. (2014) ‘Word-of-mouth marketing.’ European Journal of Marketing. Emerald Group Publishing Limited, August. Hansen, D. L., Shneiderman, B. and Smith, M. A. (2011) Analyzing Social Media Networks with NodeXL. 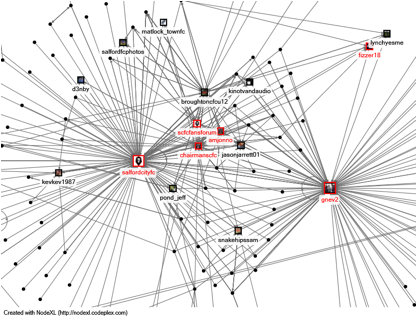 Analyzing Social Media Networks with NodeXL. Hepburn, P. (2011) Local governance and the local online networked public sphere : Enhancing local democracy or politics as usual ? A thesis submitted to the University of Manchester for the degree of PhD in the Faculty of Humanities. Manchester. Jarman, D., Theodoraki, E., Hall, H. and Ali-Knight, J. (2014) ‘Social network analysis and festival cities: an exploration of concepts, literature and methods.’ Caroline Jackson, D. (ed.) International Journal of Event and Festival Management. Emerald Group Publishing Limited, 5(3) pp. 311–322. Lin, N. (1999) ‘Building a network theory of social capital.’ Connections, 22(1) pp. 28–51. Widdop, P., Cutts, D. and Jarvie, G. (2014) ‘Omnivorousness in sport: The importance of social capital and networks.’ International Review for the Sociology of Sport. SAGE Publications. Williams, N. L., Inversini, A., Buhalis, D. and Ferdinand, N. (2015) ‘Community crosstalk: an exploratory analysis of destination and festival eWOM on Twitter.’ Journal of Marketing Management, 1376(January) pp. 1–28.